For the 1981 Miller 200 USAC stock car race at the Milwaukee Mile, Bobby Allison showed up with a #75 Chevy Malibu that I had no doubt belonged to Rahmoc. It was the same light blue paint with the same font used on the number. The race was held on the off week between the Nashville and Pocono Cup races, so it was possible for it to be a regular Cup car. According to Racing Reference, Tim Richmond had raced the Malibu at Nashville the week before. Bobby practiced and qualified fifth on Saturday with the car still numbered with the #75. By the time the race started on Sunday, the 75 had been painted over with a #28 and he finished third with it behind Rusty Wallace and Joe Ruttman. 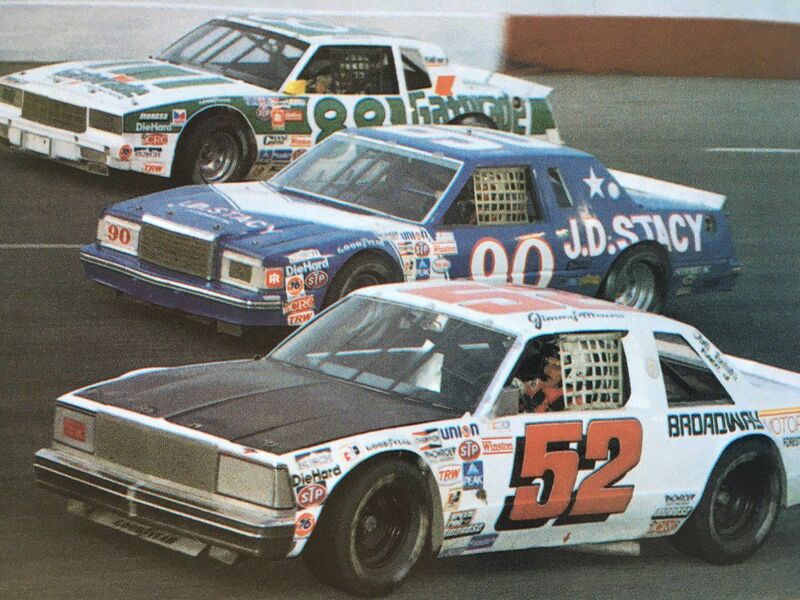 I don't believe that I've seen a picture of Malibu raced in Winston Cup action. I've seen pictures of the Rahmoc Lemans, Regal and Cutlass, but I can't recall seeing much of anything regarding the Malibu. Check the last link on Jerry's post. Dave Marcis not only raced a 1981 Malibu, he WON with it, at Richmond in February, 1982. Jimmy Means also ran a Malibu, as did Bob Kennedy in the Winston West Series. 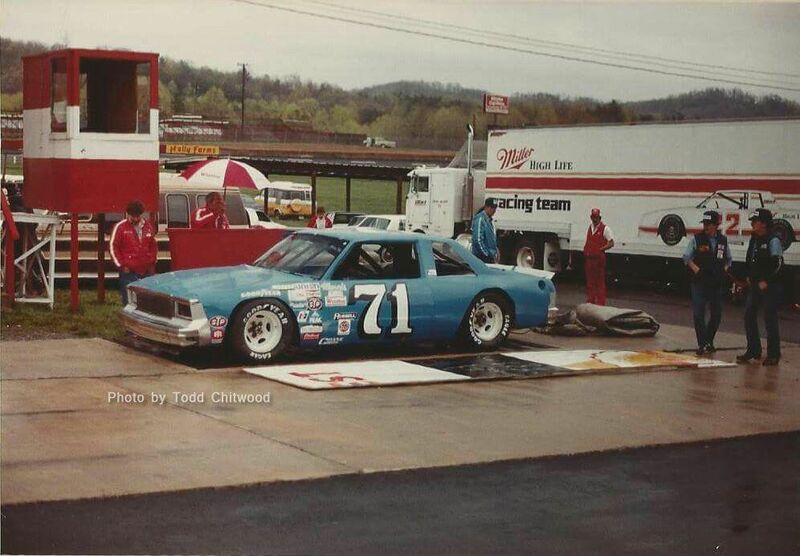 When the downsized 110" wheelbase cars debuted in 1981, NASCAR discouraged the teams from running the Malibu, as it was felt the body had too little front fender and would look too much like the Malibu then being used in the Late Model Sportsman Series. This same reasoning was why the Ford Fairmont body was never legalized for Cup racing, though it too was raced in LMS and even Winston West in the late 1970's. Looking back at my original message, I guess I was unclear in stating what I was really hoping to find. I was aware that some of the teams were using the Malibu in Winston Cup during the 1981 & 1982 seasons. What I had hoped to find was photos of the Rahmoc Malibu. I've seen photos of the Lemans, Regal and Cutlass that Rahmoc fielded during that time, but not the Malibu. According to the racing reference sites, Rahmoc fielded a Chevrolet seven times in 1981, but I don't know how accurate that is and/or if that specifically means a Malibu. Not a very good pic, but I think this might be the car you are looking for. From the 1981 Nashville summer race. Not sure what was wrong with my camera, but something was wrong - I couldn't even take a shot of a car sitting still in focus. At least this gives you some idea of what it looked like. Sorry it's not better. Nice. . It does look like it could be an Orange and White helmet which Bobby wore at times in 1981 with the Hardees colors . No, that's Tim. Bobby was driving this car that weekend. Awesome photos . I long for the days when drivers were still driving to win money to pay the house payment. WOW !!! I've never seen a shot of that car. Don't worry about the quality, Calhoun ; be happy you got it. Also, I had forgotten a few other Malibu's -- Roger Hamby as an owner in 1981, and Pat Mintey, Jr. as owner / driver in Winston West 1981 - 83. Thank you for the photo Calhoun! When I saw the Malibu in person, I knew it was a Rahmoc car, but I hadn't seen it in what little NASCAR coverage existed at the time. I wasn't sure if it had ever been on the track and maybe that was why they let Bobby use it. I know that there were other NASCAR Cup cars used in USAC competition over the years, but this may have been one of the last since USAC was on its last legs and the Miller 200 became a ASA event the following year.